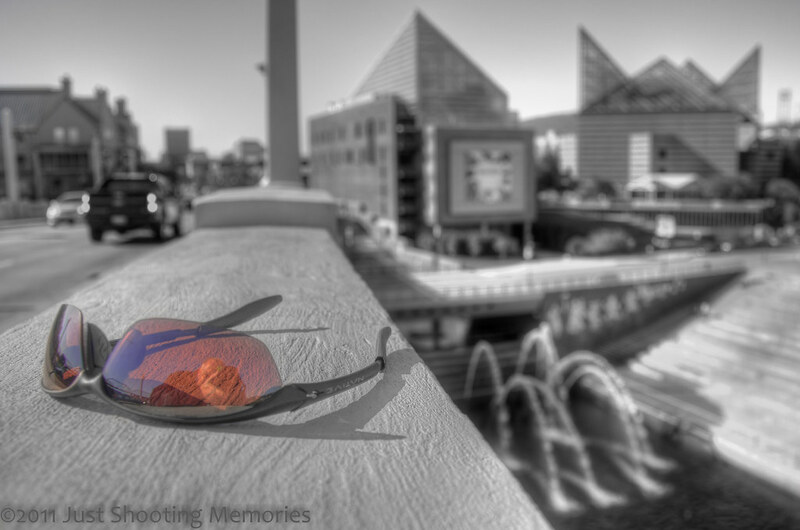 Through the Glasses | Just Shooting Memories! This was my favorite photo from the Worldwide Photo Walk. When I started the morning out, I had in my head a list of places to go and photos to take. Of course, that went out the window as soon as I began walking. In fact, this photohappened purely by accident. I had seen photos similar to this with just the sunglasses colored, but had not tried it myself. Well, I was about to take a photo of the really cool water cannons that are just by the Tennessee River and I set my glasses down. I began to frame the photo with the edge of the bridge and saw my glasses sitting one the edge. I thought it made for an interesting composition. In fact, it was not until a good bit later, during processing, that I thought of de-saturating all except the glasses. Nice color effect and reflection too. Great color effect. Looks like an ad!